Many vloggers want the best camera but don’t realize that 50% of each video is audio. Sound plays a vital role in your vlogs! Yet, many vloggers only worry about what camera they should use. While a high quality camera is important, you also need a good vlogging microphone to create high quality videos. A good vlogging microphone helps you reduce unwanted background and wind noise and increases the audio quality of your vlogs. You might be wondering.. can’t I just use the built-in microphone of my camera? Built-in microphones are terrible at filtering out unwanted noise. They don’t filter out wind noise or other unwanted background noise from traffic, crowds and other sounds you don’t want in your video. Even $1000+ cameras don’t come close to the sound quality of a $100 external microphone. Investing in a good vlogging microphone will drastically increase the quality of your videos. Check out the youtube video below for an example of a built-in microphone vs. an external microphone. Notice how all the wind noise gets filtered out with an external microphone? Now that you know how important a good vlogging microphone is, let’s pick which one is best for your videos. The perfect vlogging microphone for you depends on which camera you own and what kind of videos you produce. Shotgun microphones are the most often used microphone by vloggers. These microphones can easily be mounted on any camera with a hot shoe and a microphone jack (almost any DSLR or mirrorless camera). They provide great sound quality and help filter out unwanted background noise from your vlogs. They are very easy to use and don’t require difficult setups. Just grab your camera and start recording without worrying about audio. Lavalier microphones are tiny microphones that you can clip to your clothing. These microphones are great at capturing speech while allowing you to move around or face away from the camera. These microphones are perfect for vlogging but can also be used in instructional videos, commentary or other videos where speech is important. 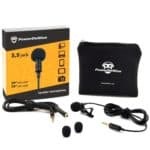 Lapel/lavalier microphones can be plugged in the your phone, a tablet or a dedicated recording device. If you record your vlogs near your computer, USB microphones are a great options. They are easy to setup and use and provide great sound quality. Whether you make tutorials, music videos, interviews or commentary, USB microphones are super versatile and popular among many youtubers. Portable recorders are a great option if you want more flexibility when you’re recording audio. These devices record high quality audio and have more advanced features such as audio playback, more file quality options and file compression capabilities. 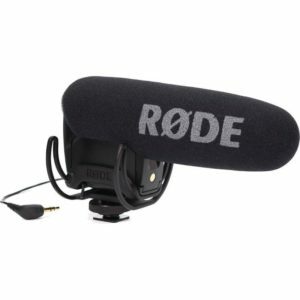 Often used in broadcasting but also perfect for vlogging, especially in combination with a lavalier microphone. Our shotgun microphone recommendations won’t came as a surprise as they are already incredibly popular among vloggers. One of the best shotgun microphones for vlogging is the Rode VideoMic Pro R.
The VideoMic Pro R has an all-new condensor capsule that records broadcast-quality audio via a regular 3.5mm microphone jack. The microphone uses a super-cardioid pattern which minimizes unwanted background noise from the side and rear and focuses on the subject in front of the camera. It also has a high pass filter to decrease low end background noise from traffic or air conditioners and level attenuation controls for very quiet or loud sound sources. The integrated shock mounting and foam windscreen minimize unwanted noise from shocks, vibrations or wind noise. The VideoMic Pro is powered by a single 9V battery that lasts over 70 hours of recordings. You don’t want to record a vlog and find out your microphone is out of battery, so keep a spare battery around or remember to charge the current one. The microphone also comes with a 10 year extended warranty. 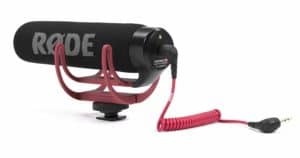 The Rode VideoMic Go is a great alternative shotgun microphone if you are a starting vlogger on a budget. This microphone is specifically designed to be easy to use for less-experienced users. It’s powered by your camera so it requires no batteries and it also does not have any complicated settings or switches. Just plug in your microphone and start vlogging without having to worry about batteries or audio settings! The integrated shock mount isolates your microphone from vibrations and bumps that may interfere with your sound recording. The shock mount is constructed from a single piece of hard-wearing thermoplastic which does not wear out unlike traditional elastic solutions. We have picked one wired lavalier microphone and one wireless. A good wireless lavalier microphone is more expensive than a wired mic but allows for much greater freedom of movement. This professional grade lavalier microphone by PowerDeWise is our favorite wired lavalier microphone for vlogging. This microphone has a 3.5mm microphone jack so you can easily plug it into your camera, laptop, phone (Android an iOS) or audio recorder and start recording. The microphone does not need any batteries but instead runs off the power of the device. The microphone has with a 59″ (1.5m) cord and also comes with a 78″ (2m) extensions cord to provide you more freedom of movement. If you connect this to a dedicated sound recorder or a phone instead of your camera, you can get many of the advantages of a wireless lavalier microphone. Keep the sound recorder in your pocket and you don’t have to worry about how far the camera is while still having good audio! 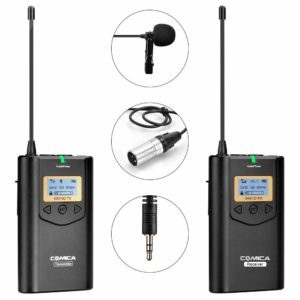 Our favorite wireless lavalier microphone for vlogging is the Comica WM100. This wireless microphone is capable of transmitting your audio over a distance of up to 330ft (100m) which should be enough for almost any vlog. The transmitter has a LCD screen for real-time audio status monitoring, adjusting volume or signal strength or to switch channel. You can also perform a local audio test so you don’t have to find out the audio of your video was off after recording a video. The transmitter and receiver use 2x AA batteries (not included) so add some rechargeable ones to your basket when ordering! Both the best and the best budget USB microphones are from Blue Microphones. They provide great sound quality and are known for how easy they are to use. If you are looking for the best USB microphone for recording your videos, the Blue Yeti is a great option and used by many youtubers. The microphone has a standard 3.5mm headphone jack which allows you to minitor your recording in real-time. The microphone also has control dials so you can easily make adjustments on the fly or mute the microphone. All of this is incredibly easy to set-up: simply plug in the microphone to the USB port, calibrate it with your operating system and you’re ready to record! The Snowball is a great budget alternative to the more expensive Yeti listed above. This entry level USB microphone provides a lot of value for the money. 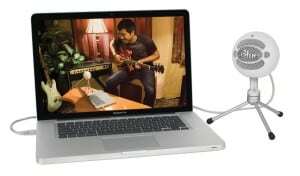 The microphone is incredibly easy to set up – just plug the USB cable into your computer and you’re ready to start recording. No need to install drivers or other software. If you’re looking to upgrade from your computers built-in microphone while on a limited budget this microphone is perfect for you! Both portable recorders we picked are by Zoom. A high quality brand that produces great audio recorders. When you record your audio on a separate device, you’ll need to sync your audio and video in post-production. A simple trick to help you synchronize both is to clap your hands or shut a book while recording. That gives you a reference point to line the audio and video up with each other. 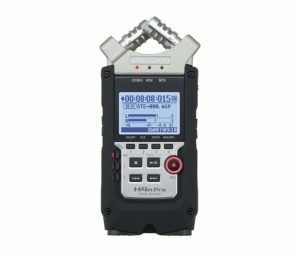 Our favorite portable audio recorder is currently this Zoom H4N Pro. It records incredible audio, has many features and is easy to use. The H4N PRO is the new and improved version of the very popular Zoom H4N. The two built-in stereo X/Y microphones have a very low noise floor but are able to handle up to 140dB so they can record crystal clear audio in every situation. It is capable of pristine stereo or four-channel recording (up to 24-bit/96 kHz) and records directly to SD/SDHC cards up to 32GB. The body is rubberized which makes it perfect to travel with and the bright screen helps you see what’s going on. The Zoom H1 is great budget alternative combining powerful recording capabilities with ease of use. The H1 features a newly designed user interface which puts all features such as track marker, auto record, low-cut filter and level and volume controls at your fingertips instead of difficult setting menu’s. The Zoom H1’s onboard microphones are configured in an X/Y pattern for the best possible stereo imaging. The microphones are enclosed so you can put it in your pocket or throw it in your bag without worrying about damaging it. The H1 is compatible with memory cards up to 32GB which should give you plenty of recording time depending on the bitrate and file format. That concludes our guide! 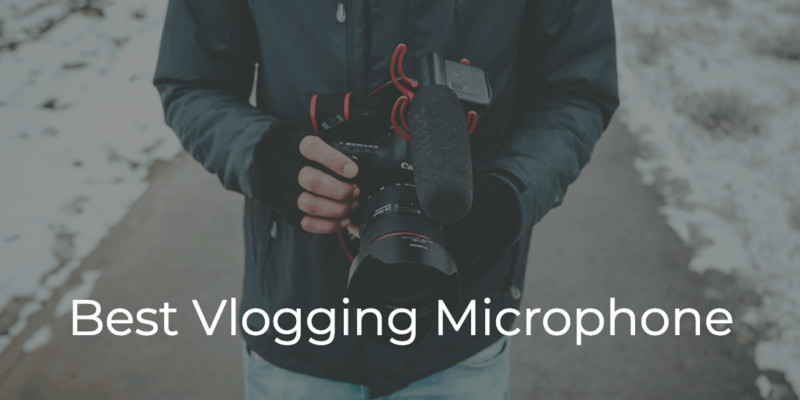 Hopefully this guide has helped you find the perfect vlogging microphone for your needs.